'Genetic Artist' ( Henry Danielson, R. 1971). Seedling F-66-1. AB (RB), 30" (76 cm). Early midseason bloom. 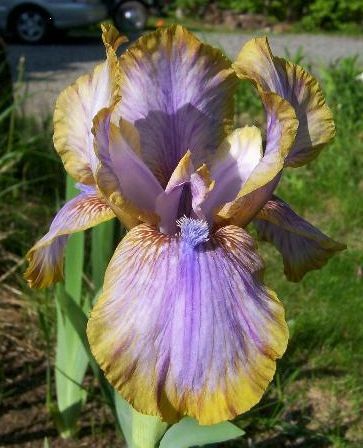 Odd combination of bronzy yellow and blue, center of petals to sides of ribs metallic lavender-blue; edges strongly colored red-bronze with tints of henna; beard lavender. 'Frost And Flame' X 'Vulcanus'. Mount Clare Iris 1972. Honorable Mention 1974. From AIS Bulletin #204 January 1972 Introducing GENETIC ARTIST. Arilbred. 30". E-M. Sdlg. F-66-1. Odd combination of bronzy yellow and blue. Center of petals to sides of ribs metallic lavenderblue; edges strongly colored red-bronze with tints of henna; lavender beard. Standards somewhat open so stylearms show, but this adds to the beauty of this particular flower. Stylearms light lavender. It appears like an artist has been at work on this flower. Fertile both ways. Frost and Flame X Vulcanis. $20.00. Mount Clare Iris Garden. From Pleasure Iris Gardens catalog, 1984: GENETIC ARTIST--Arilbred. 30", EM, Sdlg, F-66-1, Odd combination of bronzy yellow and blue, Frost and Flame x Vulvanus, HM 1973. Judges Choice 1974. First Runner-Up, C.G. White Award 1978. $3.00. jpg IMG_2911-X2_genetic_artist.jpg manage 137 K 19 Feb 2016 - 20:56 BrockHeilman Please contact Brock Heilman for image use.